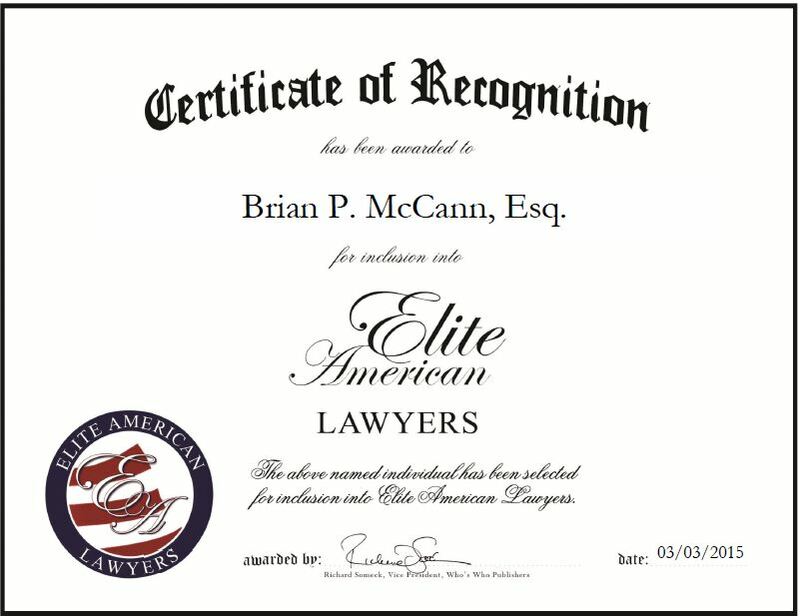 Glen Rock, NJ, March 3, 2015, Brian P. McCann, Esq., Attorney at Cavalli McCann, has been recognized by Elite American Lawyers for dedication, achievements and leadership in family law. Mr. McCann was introduced to the field of law when he worked as a clerk for a family law judge. It was this work that inspired him to pursue a career in the field. Mr. McCann has been practicing law for 15 years and started his own firm in 2009. Cavalli McCann is a well-established law firm that provides clients with services in alimony law, child support and custody law, divorce law, domestic violence law, and family law. Cavalli McCann devotes 100 percent of the practice to litigation. Mr. McCann’s experience in family, matrimonial, custody and divorce law, along with his commitment to his clients, makes him a highly regarded lawyer in the Glen Rock area. He takes the time to get to know his clients and develop legal strategies that will get his clients their desired results. He practices in the areas of family law, alimony and spousal support, child support, children’s rights, custody and visitation, divorce, domestic violence and neglect, paternity, and prenuptial agreements. Certified by the Supreme Court of New Jersey as a matrimonial law attorney, Mr. McCann has received ample recognition for his work in the legal industry. He was named as one of the Top Lawyers in New Jersey in 2011 by 201 Magazine and one of New Jersey’s Outstanding Young Lawyers, and was recognized by Super Lawyers. Although he has achieved monumental success throughout his career, Mr. McCann plans to continue growing the practice and providing clients with the highest quality services for years to come. This entry was posted in Family Law and tagged child support, custody, divorce, litigation, matrimonial law, Top Lawyers in New Jersey. Bookmark the permalink.